After a day of skiing, hiking, or golfing, relax on the cliff-top deck to watch the lake. 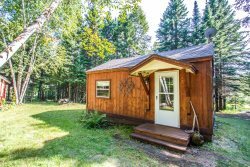 Nordkapp is a cozy 2-bedroom, 1.5-bath chalet style home in Tofte, MN. Perched atop the cliff`s edge overlooking Lake Superior- Nordkapp`s views are incredible. Enjoy direct views of Lake Superior from the living room, dining room, and balcony. Nordkapp does not have lake access, however you have a patio area where you can sit at the top of the cliff and look down at the lake below. Enjoy these incredible views from the lake-viewing patio. The cozy living room is a great place to curl up and watch a movie after a long day of exploring the North Shore. Light up the stove fireplace and enjoy the warm ambiance of this vacation rental home. The living room opens up to the dining room and kitchen area behind the couch. The ladder leads up to the sleeping loft area above. Large windows allow you to take in the views of Lake Superior from all areas of the living room. The living room is open to the dining room which is open to the kitchen, making this a semi-open living area. The galley style kitchen is small but well-equipped for everything you need to prepare a meal during your stay. Enjoy this beautifully remodeled kitchen featuring solid wood cabinets and granite counter tops. Enjoy a meal as a family in the dining room area. The views of Lake Superior while you dine are amazing The main level master bedroom has a queen sized bed. There is an attached half bath off of the main level master bedroom. The sleeping loft area is open to the living room below. The large area has three beds and plenty of space to spread out- perfect for older kids There`s lot of natural light in the loft area, too. The cozy and welcoming sleeping loft makes Nordkapp a great destination for families. The main level guest bathroom has a shower/tub combo. Nordkapp even features a small sauna located right in the house The washer and dryer is great for those coming for extended stays. Step out to the lake-facing balcony and enjoy the Lake Superior views. Grab a cup of coffee in the morning and sit back with a good book while listening to the waves splash against the shoreline. Enjoy unobstructed views of Lake Superior. The view of Nordkapp from the lake-side area note: the lower level is not included in the rental. Nordkapp has one neighbor to the right check out our Gull Harbor rentals and then lots of privacy to the left. The cliff location makes the lake views incredible Enjoy your next North Shore vacation at Nordkapp, your Lake Superior home away from home. You can enjoy this traditional cedar paneled north woods chalet year round and be charmed in every season. Nordkapp, which means "North Cape" in Norwegian, is conveniently located near skiing, hiking trails, and mountain biking trails. Lutsen Mountains Ski Resort and Summer Recreation Center and the Superior National at Lutsen Golf Course are just an 8-mile drive away, which makes Nordkapp a great place to stay in every season. Enjoy the many dining options available within a short drive of this charming and much loved Lake Superior home. Start your morning with a cup coffee on your private Lake Superior viewing deck and watch for passing ships while listening to the waves crash against the cliffs below you. Although there is no lake access, the views from this home are absolutely breathtaking and unobstructed by other homes. Then cap off your day with a sauna, a Scandinavian staple popular on the North Shore, and curl up in front of the wood stove in the living room for game night or a movie. The cozy interior features a bedroom with a queen bed and 3 twin beds in the open sleeping loft. This layout is great for families with older children or friends traveling together on a ski trip. There is just a nice vibe when you enter Nordkapp. At Nordkapp you are just a short drive away from the beautiful Oberg Mountain Scenic Overlook and hiking trail, a must-see during leaf changing season. Head down the shore and check out Temperance River State Park or head up the shore and you will find Cascade River State Park - both great for hiking and enjoying some beautiful waterfalls. The Gitchi Gami Bike Trail is nearby and runs along Highway 61. The trail is enjoyed by bikers and walkers alike, taking a scenic ride or stroll along Lake Superior's shoreline. The Lutsen Mountains recreation area is just 10-miles away and offers both winter and summer activities including skiing, the alpine slide, and a scenic gondola up to the Moose Mountain Summit. Enjoy the many restaurants and live music offered year-round on the mountain, as well. Be sure to take a day trip up to Grand Marais to enjoy the quaint town and its many small shops and unique restaurants. Whether you've come to relax or come to explore and have an adventure, Nordkapp is a great home base! Nordkapp is a great location on the Gitchee Gami trail, near the Temperance River and a short drive from Lutsen. It was very easy to find, and we appreciated the ease of using a lockbox to enter the property. We would stay here again. The deck provides a great view of Lake Superior, but it is on a cliff so there is no direct lake access. The kitchen is well equipped, and furnishings are comfortable. We had the misfortune of vacationing here on a day with a heat index of 100, and the electric storage heaters made it impossible to keep the heat out of the house by closing it up for the day. We survived with the provided box fans, some ice cream, and a stroll along a rocky beach up the road near Grand Marais. This was unusually warm weather, so I don't think this would typically be a problem. A strong thunderstorm also moved through the area during our stay, and although we didn't need it I appreciated that there was a clearly marked power outage supply box in the laundry room. Location is wonderful - easy access to many state parks and to shops in Tofte, Lutsen and Grand Marias. Really enjoy staying at Nordkapp. This is our second stay and love the views and peace and quiet of the place. The home was very cozy with a beautiful view. We liked the proximity to Lutsen and all the other destinations we set out to enjoy. We did not see any staff or have a need to visit with staff. We booked our rental on line and used a lock box to obtain the key to the property. Cozy with a great view. Good sound system and wifi so I could connect Pandora directly to speakers. A lovely property with gorgeous views of the lake. Warm and cozy on a winter trip. Been here many times in the past, this place is the best! We loved the home. It was cozy and just perfect for the two of us. It's the second time we've stayed at Nordkapp and love the location. We come up to the North Shore to hike and the location is is great for hitting numeraous state parks and the SHT. We enjoyed the place so much we even rented it once for our son and daughter in law to spend there honeymoon there. This trip was our thirty year anniversery and it could not have been a better trip. Nordkapp is beautiful. It was very convenient to be able to do a load of laundry when it was needed. We had a lovely and very relaxing stay and hated to leave! Nice remodel to kitchen area since we were there last. Sauna Is small, but awesome. Nice to have a washer/dryer. Views amazing! I couldn't imagine a more perfect cabin to enjoy the North Shore in. Nordkapp has the perfect mix of modern amenities while still maintaining a traditional, cozy cabin feel. There are large windows covering the entire back of the cabin that allow a constant, spectacular view of the lake and surrounding forest. I couldn't get enough of it! We kept the patio door open through our entire stay so we could hear the crashing waves outside. Amazing. We also enjoyed the cliffside deck, which puts you right on top of the crashing waves with a beautiful view of the rocky shore. I also liked the location of the cabin. Although it's fairly close to other buildings it felt extremely private. Tofte has a lot of great dining options but we made the trek to Grand Marais several times. Grand Marais is a 25 minute drive in good conditions, which is a little far but definitely doable. The cabin had everything we needed. Games, books, puzzles, kitchen utensils and dishes, DVD player, etc. My husband and I are picky about mattresses but the master bed was very comfortable. We didn't use the sauna but it's a nice amenity to have. The cabin also has a really nice stereo with surround sound. We brought a cable to connect our devices. We will definitely be returning to this gem of a cabin!